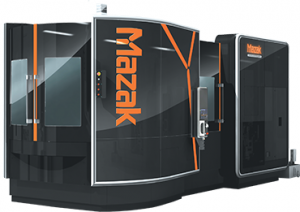 The µ-8800 is a high-performance small machining center for 800×800 mm pallets. It is equipped with a variety of countermeasures for heat displacement to ensure stable accuracy over long periods of operation, providing the same machining accuracy as a Jig-borer. To ensure stable machining accuracy, temperature controlled cooling oil circulates through the column and base. Thanks to this system, the temperature of each component is stable to prevent any displacement. Temperature controlled cooling oil circulates throguh the cores of X-, Y-, and Z-axes ball screws to ensure stable machining acuracy over extended periods of high speed operation. A Magnescale system is used to measure the actual positions of the column, spindle head, and table. This system provides high precision positioning over extended periods of operation. 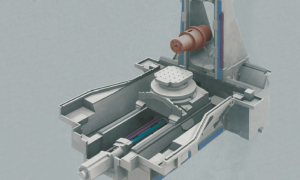 To prevent thermal displacement caused by coolant temperature increase due to heat generated by machining, the coolant chiller unit maintains the coolant temperature to be the same as room temperature. 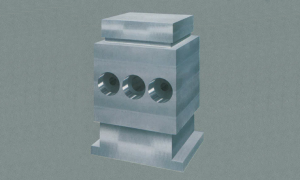 10000 rpm Spindle – High rigidity spindle designed for the machining of steel and difficult-to-machine materials. Max. output: 37 kW (50 HP) [30 min. rating], Max. torque: 525.6 N-m (391 ft-lbs). 7000 rpm Spindle – High torque, high rigidity spindle with 2-speed gear range designed for the machining of steel. Max. output: 30kW (40HP) [15 min. rating], Max. Torque: 1176.7 N-m (868 ft-lbs). 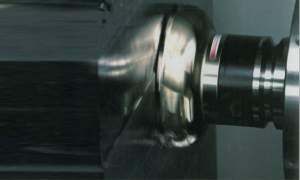 7000 rpm Spindle – High torque, high rigidity spindle with 2-speed gear range designed for the machining of steel. Max. output: 30kW (40HP) [15 min. rating], Max. Torque: 1176.7 N-m (868 ft-lbs). 15000 rpm Spindle – High power, high speed spindle designed for high speed machining of aluminum and other nonferrous materials. Max. output: 37kW (50HP) [15 min. rating], Max. Torque: 104 N-m (77 ft-lbs). The µ series, equipped with a variety of countermeasures for heat displacement, provides positioning accuracy 4 times better than the ISO 10791-4 standard in place. Because of considerable reduction of vibration caused by high speed axes acceleration/deceleration, unsurpassed accuracy stability from temperature regulation, and coupling systems with the taper cone system that ensure high positioning accuracy for the pallet change cycle, the µ series can easily manage any size lot with the ultimate in accuracy performance.